A stolen vehicle rests on its side after a high-speed chase originating in Bonneville County ended in Blackfoot Tuesday. A crew from a towing company prepares to haul away a stolen vehicle after a high speed chase originating in Bonneville County ended in Blackfoot Tuesday. 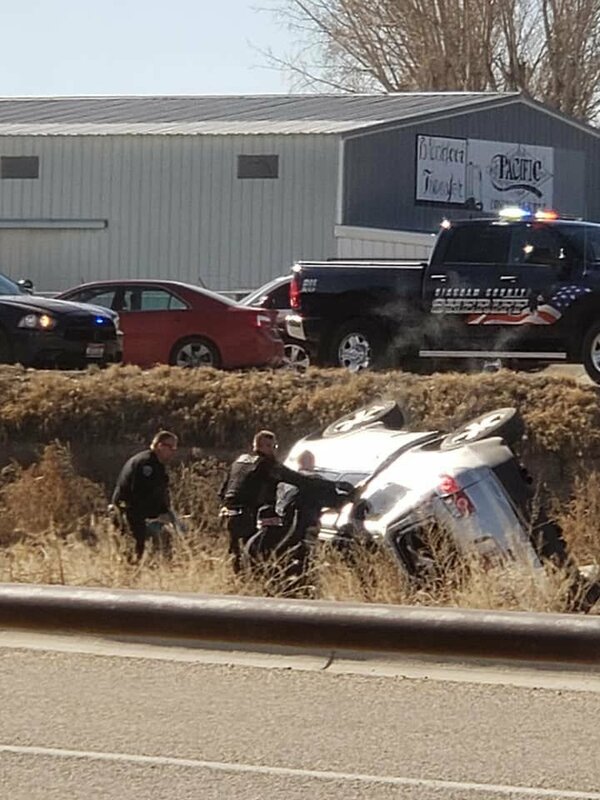 BLACKFOOT — A high-speed chase that originated in Bonneville County on Tuesday morning ended with the stolen vehicle rolling on its side in a canal just off of Bridge Street in Blackfoot. Several different law enforcement agencies were involved in the pursuit, an Idaho State Police news release said. The series of events began at 10:20 a.m., when an ISP trooper located a stolen vehicle in Bonneville County. A 2012 GMC Acadia driven by a juvenile runaway was located at the Chevron gas station off Interstate 15 and 65th South. As the trooper attempted to stop the vehicle, the driver backed up and hit the trooper’s patrol vehicle and another vehicle that was parked, police said. An officer said the 16-year-old runaway allegedly stole the vehicle and with the aid of two friends left the Idaho Falls area heading south. The vehicle was later located by Bingham County Sheriff’s deputies. Deputies attempted to stop the vehicle and the vehicle’s driver fled again, resulting in a pursuit through Blackfoot. Units were dispatched north from Pocatello to help intercept the stolen vehicle. Police said the vehicle drove through the parking lot that services McDonald’s and the Ridley’s grocery store at high speed, with several cars in pursuit, exiting by a second fast food restaurant and onto Parkway. The suspects then crossed Bridge Street and went into the parking lot of a fitness center, made a U-turn and tried to cut across back onto Bridge Street without realizing that the vacant lot was considerably lower than the parking lot that they had left, police said. The vehicle rolled and came to rest on its side where the occupants were apprehended. The driver was arrested on the scene and was transported to the Bingham County Courthouse, while the two passengers were taken to Bingham Memorial Hospital for treatment.